Louis Armand’s The Combinations is an unprecedented ‘work of attempted fiction’ that combines the beauty & intellectual exertion that is chess with the panorama of futility & chaos that is Prague (a.k.a. ‘Golem City’), across the 20th-century and before/after. Armand’s prose weaves together the City’s thousand-and-one fascinating tales with a deeply personal account of one lost soul set adrift amid the early-90s’ awakening from the nightmare that was the previous half-century of communist Mitteleuropa. 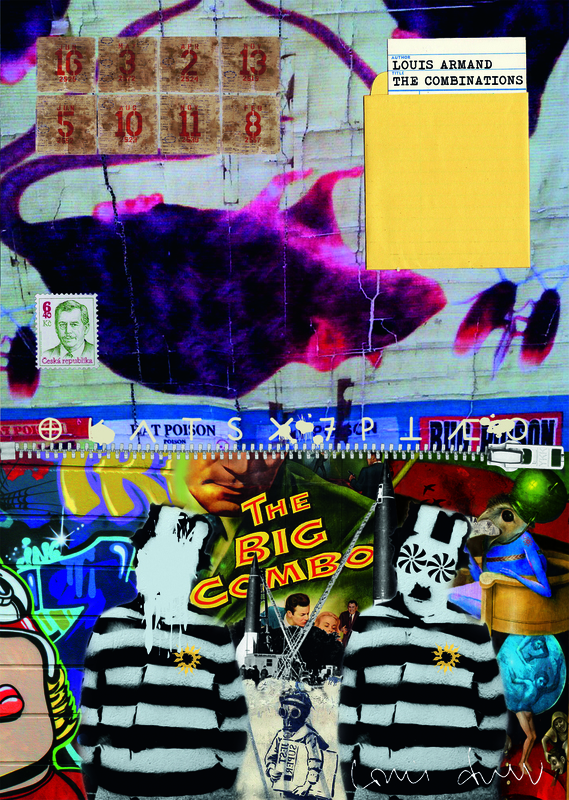 The Combinations is a text whose 1) erudition dazzles, 2) structure humbles, 3) monotony never bores, 4) humour disarms, 5) relentlessness overwhelms, 6) storytelling captivates, 7) poignancy remains poignant, and 8) style simply never exhausts itself. Your move, Reader. There’s true ambition in trying to ride the big loop (all of Prague, all of history) and the small one (a single lost soul) at one and the same time. Even before opening a page of the novel, you have a warning pressed into your hand, a challenge to take its dreams seriously – whether or not you’re disarmed by its humour as well. Němec’s world is one where sense comes and goes, fragmentarily. His quest has something of the screwball about it, leading him from library to nightmare to mad old professor, but in the end it takes so long, and becomes so tedious, that he ends up hoping it might be ‘a scam gone wrong’. Possibly it is. You can define a scam by how much time it wastes. Němec did his best to envision echoes of machined angelspeak blown by cosmic winds, of agonies & bewailings, fall of Babel, toppling stone & shattered etceteras, Nimrod’s gibberish. But to no effect: the words on the page looked simply like the shrieks of an inmate in a nuthouse. Convulsive xenoglossings of the pentecostally brainbaked. At times we know it’s him talking; at others it’s someone else, one (or more) narrative voice(s); they all become entangled with the flow. The distinctions between Němec and Prague are never clear, as if he were only a blemish on its skin. Armand’s writing loosens and contracts according to circumstance, weather, smell of drink, time of day. A whole page is consumed by one footnote. The text of a novel becomes the type of a script, the script of a hand, the pictures of a comic-strip. Němec appears in the same places twice, toppling repeatedly into dive-bars or cabarets. Unfolding slowly and disdaining its notional plot, The Combinations comes to read like a distended roundelay. This is the novel as both dance and farce. Sixty-four chapters, plus an overture, and an intermission, and a coda – each ‘an image from a film, but you can’t remember which one’. Kingsley Amis once distinguished two phases of the morning after: the ‘physical hangover’ and the ‘metaphysical’ one. They’re to be tackled in that order: you can flush a headache out, but regrets and memories may prove more elusive. Armand’s narrators are usually lushes, too, and they keep drinking themselves out of clock-time, making narrative from their delirium. The acme was Hess in Canicule, a ‘down-on-his-luck screenwriter’ marooned on the beach at Collioure. He drinks with psychotic dedication, trying to escape idleness while his more talented wife Louise writes a monograph on a Fauvist painter. In the daily heatwave of the title, the couple convene from time to time, so that Louise can eat salad and Hess can fumble for his second bottle of the day. Then it was Hess’s turn to talk and straightaway he began to ramble. In his mind their conversation took on a completely surreal quality. He was no longer sure of who was speaking. Someone beside or behind him seemed to put the words in his mouth. Like a ventriloquist’s dummy. But the things they conveyed were entirely in his head. When he looked around, nothing out there seemed quite as real. It’s characteristic of Armand’s novels not to treat a character as a diminished human being – a person acting shamefully like an animal – but as a material creature who’s suddenly gained a frightening insight into the world. Armand’s figments are little better than puppets, and the reader is seated up in the gods; we watch them impersonate humanity with a failure that’s partly touching and partly grotesque. In The Combinations, too, when Němec puts down his glass long enough to walk, it’s a shambling, Keatonesque spectacle. He moves through the streets like a bundle of limbs, flailing towards the end of a quest he barely understands. Just past the riverclock the bent lanky figure in dusty bowler hat & suit boarded a Braník-bound tram. It shuddered & swerved along the quays, past the steel rail-bridge… The lone rider disembarking. Then down to the river on his own legs, a dirt path half sluiced away, a wooden bench to watch the ducks drifting by, empty the mind of its arcane dross – the air less suffocating here but still not exactly what you’d call breathable. At moments like this, he’s described with detachment, as if he were being moved through a videogame cut-scene. There’s often a special kind of clumsiness to Němec; we’re shown an autonomous being, but in a portrait which makes the body’s design, its need to be controlled, visible in the lurch of its movements. Armand has long been enthralled by that picture, where the autarchy of a soul is jettisoned for wires connecting it to systems, networks of thought, distributed intelligence, agents as fronts for something invisible and dark. In 2005, he referred to the Internet as ‘a multi-user system with a radically decentred structure’. Intelligence appears like a symptom, read out of a mechanised process. Forget the individual subject of analogue reality – Němec might not be a man at all, but just an output of The Combinations, a complex program, a thinking machine testing itself against itself. Němec stood there with the rain thudding onto his bowler hat. The thudding grew heavier, then after a while it virtually stopped. … Ever since the night the Prof’s ghost first appeared, the night of “the Fall”, Němec had felt he was passing through the word without really touching it – a world that’d narrowed, a world standing still. From the moment of that ‘Fall’, the ghostly appearance which opens the novel, he’s been sliding through the map of Prague as if the city were only ‘virtually’ real itself. Coursing through the air of Prague, these numbers come to haunt Němec’s movements. They ebb in and out of comprehension, fuzzing into the background as soon as heard. Ambient interference rises from nothing and vanishes again: the evanescent coming back. Whenever he turns a corner and stumbles upon a radio-set, voices begin to speak from what’s repeatedly called ‘the ether’. He shrugs off this particular encounter, letting Severínová tap her fingers ‘morselike’, ‘as if hypnotised’; but as he hurries through the shadows a few days later, those phrases will echo in his head unwanted. Feet wet, shoe soles worn through. It’s cold, it’ll grow colder. He could feel the steel pins in his knee – a creaking of the joints like a rusty gate – bits of metal in his head tuning into the frequencies, numbers on the ether. Achtung! Neun neun fünf neun zwo. Neun neun fünf neun zwo. Achtung! The activities of the radio come, in Armand’s novels, as intrusions from another world. Its sounds break into Němec’s internal monologue, distracting him the way human voices rarely can; they take hold of his attention and imprint upon it, refusing to die away. The presence of these clips is a mystery we’re not sure we’d want to solve. Most of the known numbers stations were discovered by amateurs during the Cold War; they were tuning through the airwaves when, by a quirk of timing and bandwidth, they stumbled on something they shouldn’t have been hearing. The broadcasts carry an aura of the purgatorial, of a limbo that was meant to stay closed. Often the voices sound like children, though they only exist as machines. The radio-sets of The Combinations are cursed objects. They’re capable of playing their amiable trash while occupying space like a Kubrick monolith. They hide in plain sight, in bar corners and on kitchen shelves. Each one verges upon becoming the instrument it is for Cocteau’s Orphée, relaying numbers from somewhere unknown and fatal. The night was wearing on without getting anywhere. Some part of the mechanism was missing, some obvious piece of the puzzle. Like a conversation with whole sentences left out, excised, undreamt, forgotten, that no amount of reason could restore into a meaningful dialogue. You joined the fragments & what you ended up with was interference all down the line, a picture with no sides, mists of whitenoise scored across with ravines of static, unmappable, a coagulation of dissolved forms in place of any thing. The novel is tuned into what Cairo heard as ‘the faint crackle of a radio set to no frequency’, what Canicule transcribed as ‘words spiralling in their own noise’. Armand’s ‘ravines of static’ could be broadcast from Silent Hill: out of the static come voices, calling and warning and mocking, and you keep sensing, with fear, that they know more than the protagonists they obscurely seem to condemn. Approaching a radio-set, whether one ‘antique’ or one ‘portable’, all the hissing that Němec hears has the print of sinister times and places. He interprets it both as ‘Godspeak’ and as ‘randomness’; his thoughts grow more and more ‘spekulative, konspiratorial, downright fantastik’. To begin with, it’s possibly misleading to speak about a central “character” in this film. … If this “character” had existed, been a real person, in flesh & blood, he might’ve visited a spiritualist, held a séance, communed with the spirit – only he doesn’t, he’s just a “character”, borrowed, by the way, from a nineteenth-century Norwegian playwright. A kind of ghost, therefore, or a ghost of a ghost. The ‘Norwegian’ hint may check out, but either way it’s covering the obvious link to Jan Němec, the Czech New Wave director, whose Oratorio for Prague captured the Warsaw Pact invasion, and who was made unwelcome in Prague soon thereafter. What’s happening in this ‘Intermission’, then, could be his fictionalisation in the character ‘Jan Němec’, or the cinematic ‘Němec’, or Němec the novel’s protagonist – it’s unclear how you’d pin any one of these relations down, how you’d tell which way round the influence flows. Names have become replaceable labels; the virtual and the real trade their signifiers back and forth. The problem confronting “Němec” is that he can’t picture himself outside a film – so the question he asks himself in each situation is, What type of film am I in? Is it this type of film or that type of film? Armand has designed a world where finitude is just another process, able to be paused, ended and started again. Němec may seem an unusual character, not quite up to being a person, but then The Combinations enjoys bringing material things to life and letting them sputter out. In a section from the thirty-ninth chapter titled ‘Celluloid Dolls’, we follow him underground into the Kabaret Grünegast, and wait for the enigmatic actress Alice Steinerová to appear on stage. In the meantime, Miss ‘Ruby Ray’ is up there, a singer with a voice that ‘well[s] up slowly from some dark place’. The performance becomes eerie; Němec becomes absorbed. While Ruby Ray sang, a pair of celluloid dolls on a chintzdraped Turkish sofa were wheeled on stage by figures in blackface. The dolls were arranged sidebyside, crossdressed: a man’s pointed face above a black satin gown, a woman’s blonde curls fringing an SS uniform. The band blew harder. As the tempo increased, the dolls suddenly came alive under the hands of the sinister blackfaces, jerking in unison in a spastic, repetitive, masochistic labour – their silhouettes like caged animals in a zoo. While this was in progress, Ruby Ray dissolved into the shadows like an apparition. If there was any point to the performance, Němec was at a loss to guess what it was. Then the music went down & the stage went dark again. The band sat back for the next take while the dolls got wheeled around to the wings. The hero himself, often described as a puppet, marionette, or pseudo-human, is yet to understand that all created things can die with the living. It’s when that transience has room to glint, in all the novel’s peculiar obsessions, that the relentless experiments of The Combinations briefly become absorbing. When something about Němec’s twin lives, as a person and as a thing, are brought vividly into their irreconcilable doubleness, Armand’s novel touches on something rich and philosophical. As the day progressed, the weather closed in: discontinuities accumulating like celluloid, voiceovers, ghosts in the machine, faces on sidewalks, on shop windows, cars, framed in grey light, in rain, in silhouette. A thousand doppelgängers, rubber masks, identikit mugshots with eyes blacked-out, crossed-out, scraped-out, billboard faces selling untold visions of future paradise, prostitutes in suits, in fancy dress costume, in uniform always with a product to see. As the narrative marvels, this is ‘like some future war zone in a movie about a past no-one could remember, & that no-one would ever make’. It’s a virtuoso cascade of images, cut rapidly from shot to shot, with a lively mess of the documentary (‘framed in grey light’) and the human touch (‘untold visions of future paradise’). Then the sequence is over; the paragraph ends. The next begins as ‘a continuous tracking shot’. The cinematography has changed, its experiment done, and the tram carries Němec away. Cal Revely-Calder lives outside London. He is a contributing editor at the Cambridge Humanities Review, and his writing (critical and creative) has also appeared in The Guardian, Literary Review, 3:AM, Prac Crit, and Blackbox Manifold. The Combinations is published by Equus Press. Author bio courtesy of the same. Posted in Book reviews and tagged ghosts, louis armand, The Combinations. Bookmark the permalink.